In my last post, I was using the RTL2832 TV tuner dongle to get a simple Software Defined Radio (SDR) operational. I wanted to use the SDR# program as my receiver but found that the MS Windows tool would not work and so I targeted Gqrx as an alternative. 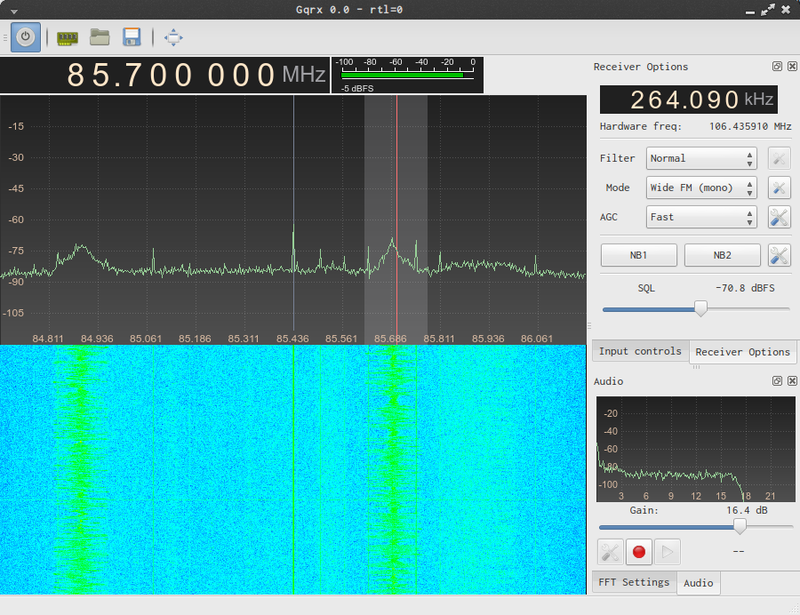 Gqrx is dependent on the GNU Radio. So in this post, I plan to get Gqrx and GNU Radio up and operational with the RTL-SDR dongle. I spend some time with other tools to help further verify (with mixed success) that GNU Radio is working. The contain here comes from multiple source and I attempt to list those sources below. For a good video to get a sense of what your in for, check out this video. Also, this post covers many of the topics here. 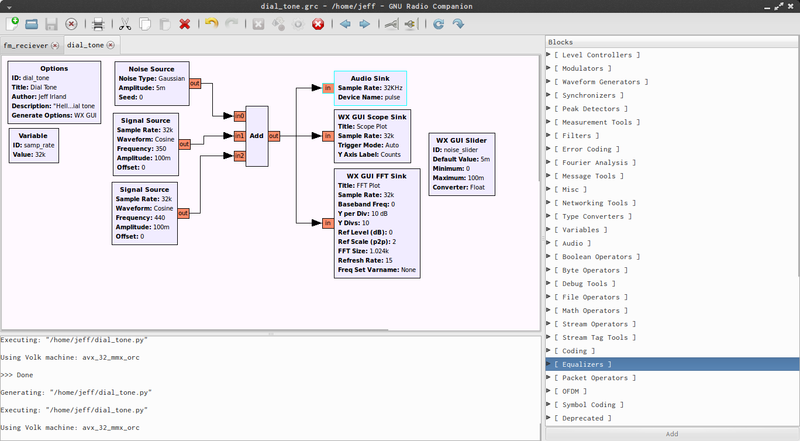 GNU Radio is a free & open-source software development toolkit that provides signal processing blocks to implement software defined radios. It can be used with readily-available low-cost external RF hardware to create software-defined radios, or without hardware in a simulation-like environment. It is being used in hobbyist, academic, and commercial environments to support both wireless communications research and real-world radio systems. 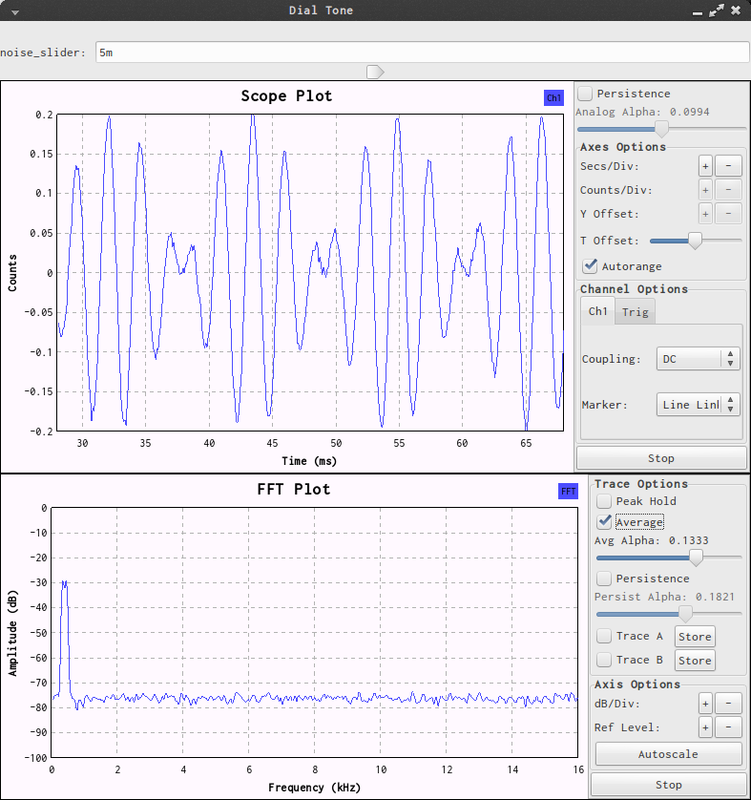 Gqrx is an experimental AM, FM and Single Side Band (SSB) software defined receiver implemented using GNU Radio and the Qt GUI toolkit. Currently it works on Linux and can use the RTL_SDR dongles as input source. Also within this post, I venture out from gqrx to examine a few other tools. I don't cover much territory, nor have much success. 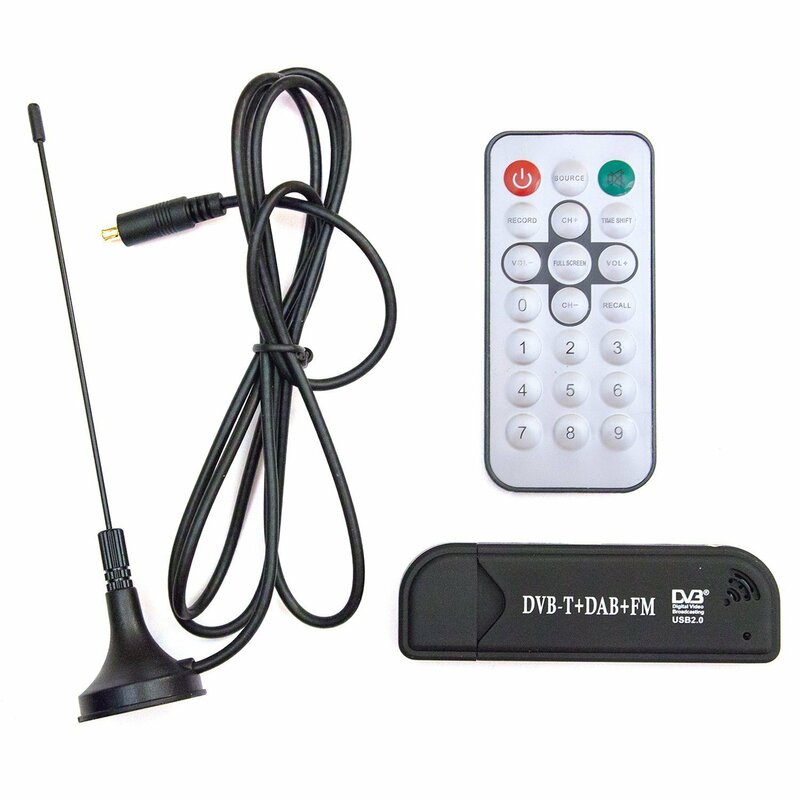 The insperation to examine these other tools comes mainly from the lengthy post "RTL-SDR and GNU Radio with Realtek RTL2832U [Elonics E4000/Raphael Micro R820T] software defined radio receiver". Also check out "Getting Started with GNU Radio and RTL-SDR (on Backtrack)". When prompted, tell it to proceed and give it sudo privilege by typing "Y". Because of the --verbose option, you will see a lot of text whizzing by as the build-gnuradio script does its thing. You’ll also see a percentage complete indicator as the script works its way down it tasks. The GNU Radio build creates a large variety of tools which get installed into /usr/local/bin. You also notice that tools not directly related to GNU Radio are also created. I'll leave it for another time to understand and explain the GNU Radio environment. To verify that the software is working, best thing is to create the typical "Hello, World" program, just we might have done for our first foray into C++, Python, or other programming language. In the world of GNU Radio, this program has come to be the phone dial tone. To do this, I followed the video The "Hello World" of GNU Radio: Dial Tone and the gnuradio.org. I did this using the GNU Radio Companion (executable located at /usr/local/bin/gnuradio-companion). GNU Radio Companion (GRC) is a graphical tool for creating signal flow graphical models and generating Python source code for the model created. I had sufficient success to convince myself that GNU Radio was work. Click "OK" and the screen below will pop up. 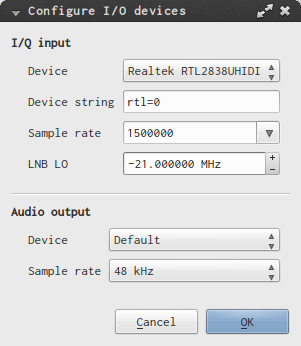 Make sure you have the RTL-SDR dongle plugged in and select the button on the top left to start processing data. I have tuned the radio to a local FM station at 85.7MHz and listen to Washington Nationals vs. Phillies baseball! This radio receiver is capable of demodulating muitiple modes, specifically AM, FM, USB, LSB , WFM. TV-FM, PAL-FM. It's easy to use and has an automated scanning and spectral zoom features where clicking on the spectrogram or panorama to tune to the frequency of interest. When I executed multimode.py, it didn't product a display. I suspect its some subtle Python code problem, or more likely. incompatibility with the latest GNU Radio libraries. For now, I'm going to abandon this. When I attempted to do the make, it complained about missing Gun Radio files. I suspect the GNU Radio libraries and include files are layed out differently since the time gr-scan was designed (August of 2012). I'm leaving fixing this to another time. In this and the previous SDR posts, I focused on getting a taste of the technology without committing myself to much of an effort. I really need to study and understand the tools that I have assembled. I still need to do a great deal more studying of the radio spectrum itself ... I feel like I'm wondering in the dark most of the time. Also, I feel that I'm very limited by the antenna I'm presently using (the pitiful dipole that came with the RTL dongle). I'm thinking of building a better antenna. Maybe try to pickup a NOAA weather satellites, with its distinctive audio signal when demodulated, and decode one of its satellite weather photos .... maybe. Another problem with the RTL-SDR is that its internal oscillator is cheap and drifts, resulting in clock errors with many kHz of frequency display error in SDR - depending on a band you're listening to. This is very annoying if you use your dongle as a radio scanner - what's the point of knowing frequency of a transmitter if it's almost random on your SDR? This frequency error is linear across the spectrum, and can be adjusted in most SDR programs by entering a PPM (parts per million) offset value. So I need to calculate this error offset so I can calibrate the SDR software.